From the Kitchen: Asian Chicken Salad | Stahancyk, Kent & Hook P.C. With warmer weather hopefully coming soon, lighten up your dinner with this Asian-inspired chicken salad. For the dressing, combine all the ingredients except the oil in a large bowl. Slowly whisk in the oil to the dressing mixture and set aside. Preheat the oven to 425 degrees. Coat the chicken with the soy sauce and sesame oil, place on a sheet pan, and bake for 20-25 minutes or until it’s cooked through. Let the chicken cool for 20 minutes. Toss all of the shredded vegetables in the bowl with the dressing to coat. Dice the chicken in one-inch pieces and toss with the vegetables. 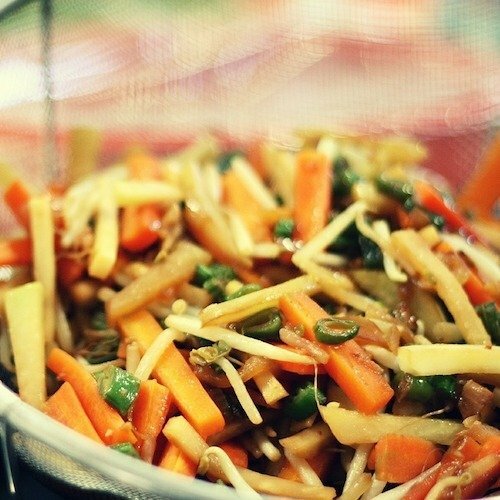 Place on a plate and top with crispy fried rice noodles. Serve chilled or at room temperature.